Aw that brings back memories. My Mum used to make them and called them Melting Moments, they looked exactly like yours. Oh gosh Janice I think that could actually be their official name now that you mention it! They've always been Cornflake Biscuits to me. Will go and add that to the post. I KNEW you would be the one to come to for glace cherry advice! Fanny was certainly a fan. I am now on a quest for the elusive blue cherry. 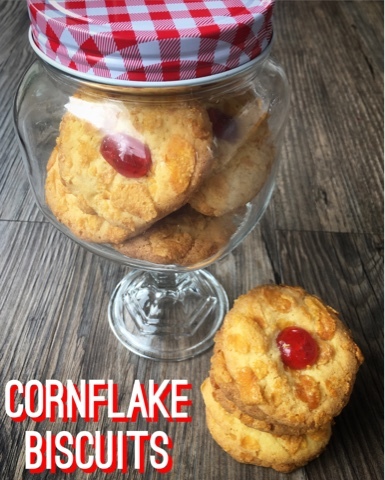 I love the name Cornflake Biscuits, reminds me of those chocolate-covered Cornflakes and Rice Crispies I used to (as I'm sure we all did) make as a child! Absolutely! Chocolate Krispie Cakes are a vital part of every childhood. 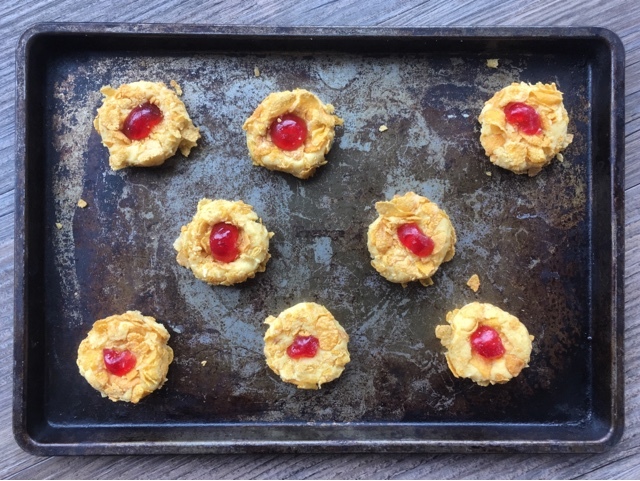 I'm loving that this recipe has brought so much nostalgic memories. Ooh we used to get these at school and they called them melting moments there too. I would love to try one again! I'm still a wee bit confused over the whole Melting Moments name as I think of them more as chunky circular custard cream type biscuits. 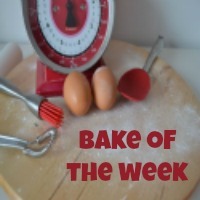 I love love love retro recipes! We've recently been given the handwritten recipe book Pete's mum used to write her recipes in, so am keen to have a good look through there and see what gems such as this I may find. 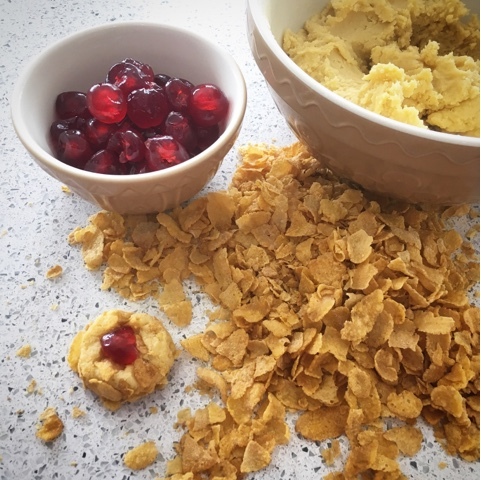 Anything with cornflakes has to be good, that's what my childhood brain says anyway! 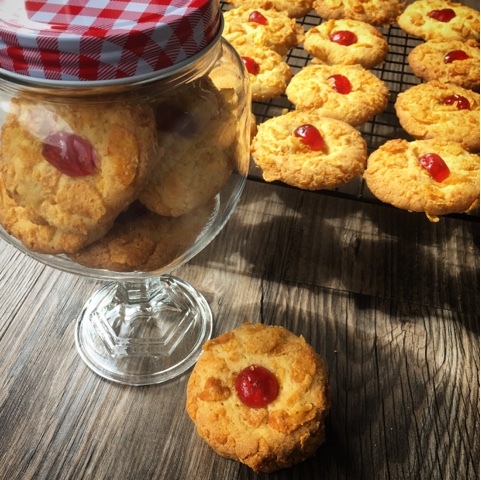 I have a couple of handwritten recipe books which belonged to each of my Grandmothers so still lots of experimenting to do and retro recipes to discover. 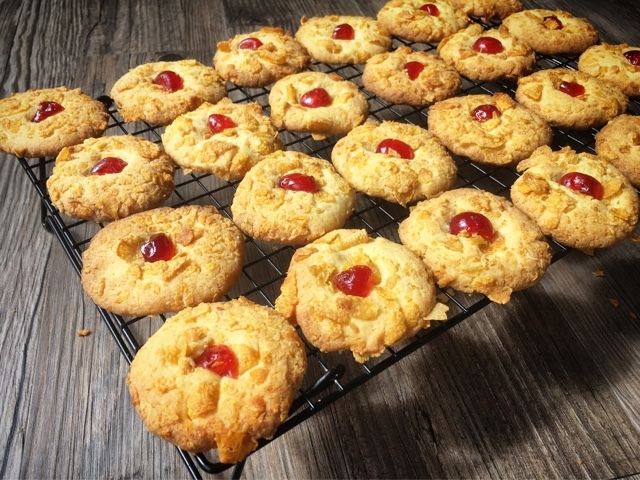 Memory lane, mum used to bake something very similar years back :) i bet they taste the same too! I love a trip down a foodie memory lane. Pleased to report that they taste just as fab as I remember. I love a good nostalgic bake, especially when they come from grandparents. We used to have a most wonderful deli here which had jars of green glade cherries, red ones and yellow ones. Sadly long gone now. 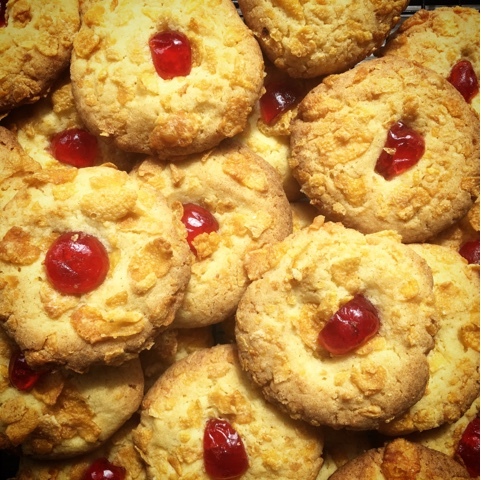 I used to make melting moments when I was a teen, but I don't remember them having cornflakes - will have to revisit. I really want to track down some multi coloured cherries now. I suspect I may have to resort to purchasing online. my mum used jam for the middle, but i dont think she used lard.